come legends from long ago. the strangest of all I know. to banish both drear and cold. The re-imagining of the legend of Wayland Smith, the legend that travelled with the vikings of long ago, is brought to live by fantastic imagery and wonderful prose. It is a story of greed, love and revenge and will stay with you for long after you have read it. I absolutely loved this book. I have a thing about old stories and what they can tell us about our lives and how they aren’t so different from those long ago. 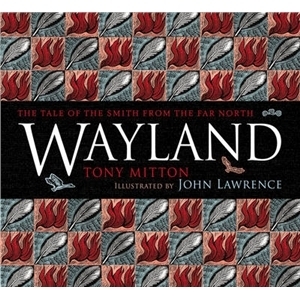 Wayland is one of those stories, told via poetry and illustrations and its one for any lover of old tales. The story is beautiful and I loved the ending especially. It follows Wayland Smith and his two brothers who find them a wive each in swan-brides. The swan-brides are destined to belong to any man who steals and hides their feather cloaks from them, which Wayland’s two brothers do. The women actually find their cloaks though and escape and that hurts Wayland so much because he did actually love his swan-bride. From there Waylands life gets worse and he finds himself in almost impossible to get out of situations. The heartbreak continues through to near the end but its still worth reading. The ending had been added to from the legend according to the authors note at the end of the book but I didn’t mind at all. The poetry is beautiful and you can really get the feeling that its a story to be told around the camp fire, with rhythm and the crackling of the embers. The illustrations in the book look like those you could find engraved in caves and tell the story amazingly well. I just wanted to stop and stare at the pictures whilst I was reading. I think they would be fantastic for any child reading to look at. There’s a slight element of adult content but I’m not sure if any child reading would really pick it up that much as I’m sure there was stuff like that in my picture books when I was younger. Although the book appears to be a picture book, with the large square format and the images throughout I think it works for all audiences. Anyone who has any interest in history or viking tales will absolutely love this book and I couldn’t recommend it enough if this sounds like you. Wayland will be published on September 5th by David Fickling Books. My copy was sent to me from the publisher in exchange for an honest review.